When it comes to tree stumps, we use nothing but the best machines, saving time and your money. The Vermeer SC40TX is the first stump grinder on the market with a stand-on platform to drive the machine. Compared with traditional self-propelled stump grinders, our experienced operators can manoeuvre the machine from stump to stump very quickly, making the procedure more efficient and cost-effective. In order to remove stumps from your property or site, there are two common options; stump grinding, or removal with a mechanical excavator. 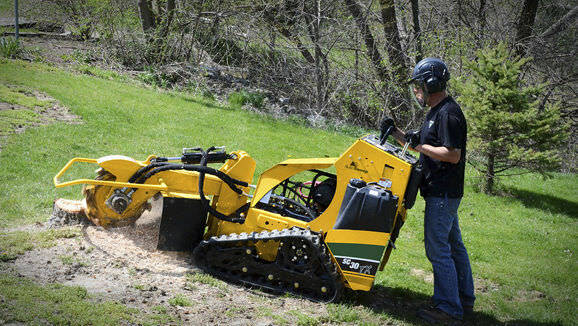 Stump grinding is the preferred method for stump removal in most situations as it limits the extent of site disturbance and environmental impact. Whether you have one stump to grind or an entire site riddled with stumps, we have the equipment to remove them regardless of terrain. Stump grinding is done with the use of a cutting wheel that moves back and forth across its surface, chewing it into chip-sized pieces. During the standard stump grinding process, we would grind an area approximately 1.5 times the width of the stump to a depth of 12-18”, depending on the presence of rocks and other obstructions. We can grind more extensively if required. After Stump Grinding is finished, a mound approximately three times the size of the stump remains. This material is left on site for your use or disposal. The stump grinder can leave some markings in the landscape from the line to the stump during travel across the terrain; care will be taken to make these as minor as possible.